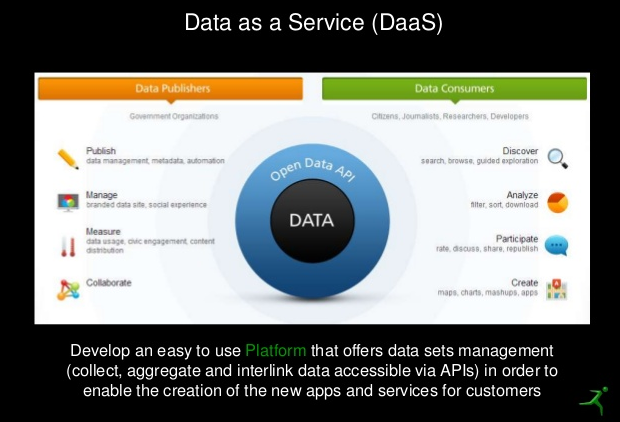 Data as a Service (DaaS) is the new paradigm where data will be delivered on-demand to be consumed within platform and third-party services. As Open Data gains mainstream adoption at every level of government around the world, public sector organizations are increasingly looking to participate in data ecosystems and drive adoption of their data as fuel for innovation. In this context open data speed up economics combining not only government’s open data but heterogeneous, large and rapidly changing dataset from every public sources like social networks, DBpedia (Wikipedia) and many more. The business idea is to design and implement an effective platform able to collect, aggregate and interlink data accessible via APIs in order to enable the creation of the new apps and services for customers. The main pillars of the entire construction is the ability to abstract both the data store and the data access patterns combining a big data architecture with traditional one depending on the data type and volume. Large datasets may want to live on a Hadoop or HBASE cluster, real-time data may have a Cassandra truth store and relax the transactional guarantees but all keep the same APIs. See the Full Sildes Here.